Prepping does not necessarily mean stocking a year’s supply of food and three of the same make and model of vehicle for spare parts. It doesn’t mean having a stockpile of ammunition or knowing how to shoot a squirrel out of a tree with a bow and arrow. The average family can and should mix common sense with practical skills to develop self-sufficiency for real world situations. To become financially self-sufficient, one should consider investing in rental properties. In today’s market, rentals are easier to acquire and due to the current economic conditions, more people are renting than ever before. If you’re new to investment properties, look into Jason Hartman’s Meet the Masters of Income Property Investing educational conference, where you’ll get practical tips on which properties are best, acquisition advice, and management skills. Beyond making more money through income properties, families can increase wealth and create self-sufficiency by reducing your family’s food bill. The costs are minimal in comparison to say, installing a wind generator or sun lights. · Planting and harvesting your own vegetables in a garden. · Plant fruit trees and plants, such as strawberries, blueberry bushes, or blackberries. · Buy at local farmer’s markets or roadside stands. · Can and freeze foods for later use. 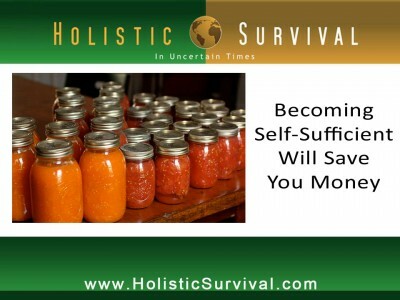 It makes sense to preserve your own homegrown vegetables; however, people often don’t even consider buying fruits and vegetables in their prime season and canning them to use when the prices rise in the off-season. · Homesteading families often raise their own chickens for eggs and fresh meat. · Learn to hunt wild game. · Make your own bread, pies, cakes, pickles, spaghetti sauce, potato chips, or anything else that would save you from purchasing them at the grocery store. Prepackaged snacks and food items are costly and filled with preservatives, sugar, and other unhealthy additives. Making your own not only makes sense financially, but also for your family’s health. Not to mention that homemade just tastes better.